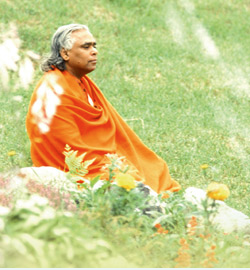 In Satsang this morning we read a segment from Swami Vishnudevananda’s Upadesa, where he discusses energy within the body and the constant movement from one wavelength to the next. He says our bodies are yantras, which is a figure, a triangle for example, that creates energy, like an engine. We must move this energy up the chakras, the energy centers in the astral body, and the only way to do this is through practice. We cannot move energy just by understanding the concept of moving energy, we must experience it and practice mindfully to get the full benefits through asanas, pranayama, japa, and chanting. “Everything originates from energy. It is the cause of our physical body. Beauty is nothing but the energy inside. ‘Avon calling’ has nothing to do with it. Vibrations keep changing because it is impossible not to change. The energy keeps moving from one wavelength to another. In the body this is called ‘old age’. Sometimes we accelerate this wavelength and old age takes place very fast. For example, if I crush this flower in my hand it will decay in a few seconds. Your body’s wavelength can change slowly or rapidly. When you do pranayama and asanas, bandhas and mudras or meditate on a chakra you are changing your wavelength, moving the energy to a higher chakra, a higher level. You want to bring your energy to the highest centre, OM. Upadesa, along with many other books, can be found in our Boutique here at the SF Center.